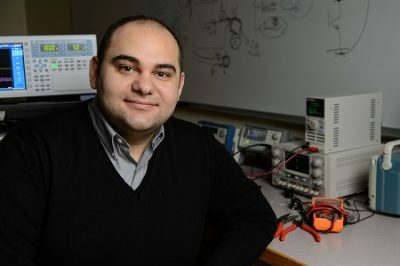 Dr. Bazzi is a UTC Associate Professor of Engineering Innovation with the Department of Electrical and Computer Engineering at the University of Connecticut (UConn). He received his PhD in electrical engineering from the University of Illinois at Urbana-Champaign (UIUC), Urbana, IL, USA. He received the B.E. and M.E. degrees in electrical engineering from the American University of Beirut (AUB), Beirut, Lebanon. He was a Visiting Assistant Professor at UIUC during Spring 2011, and an engineer with Bitrode Corporation during the Summers of 2008 and 2009. He was with Delphi Corp. as a Sr. Power Electronics Electrical Engineer before joining UConn. Y.Liu, M. Stettenbenz, and A.M. Bazzi, “Smooth Fault-Tolerant Control of Induction Motor Drives with Sensor Failures,” in IEEE Transactions on Power Electronics, Accepted. A.M. Bazzi, Y. Liu, and D. Fay, “Electric Machines and Energy Storage: Over a Century of Technologies in Electric and Hybrid Electric Vehicles,” in IEEE Electrification Magazine, Accepted. W. Chen, E. Hotchkiss, and A.M. Bazzi, “Reconfiguration of NPC Multilevel Inverters to Mitigate Short Circuit Faults Using Back-to-Back Switches,” in CPSS Transactions on Power Electronics and Applications, Accepted. N. Karakasis, E. Tsioumas, N. Jabbour, A.M. Bazzi, and C. Mademlis, “Optimal Efficiency Control in a Wind System with Doubly Fed Induction Generator,” in IEEE Transactions on Power Electronics, Accepted. A. Xenophontos and A.M. Bazzi, “Model-based Maximum Power Curves of Solar Photovoltaic Panels under Partial Shading Conditions,” in IEEE Journal of Photovoltaics, vol. 8, pp. 233 – 238, 2018. A. Silva, S. Gupta, A.M. Bazzi, and A. Ulatowski, “Wavelet-based Information Filtering for Fault Diagnosis of Electric Drive Systems in Electric Ships,” in ISA Transactions, In Press, 2017. Y. Liu and A.M. Bazzi, “A Review and Comparison of Fault Detection and Diagnosis Methods for Squirrel-Cage Induction Motors: State of the Art”, in ISA Transactions, vol. 70, pp. 400-409, 2017. P.T. Krein and A.M. Bazzi, “IEEE Transportation Electrification Community: Overview and 2016 Highlights,” in IEEE Electrification Magazine, vol. 5, pp. 72-73, March 2017. Y. Liu and A.M. Bazzi, “A General Analytical Three-Phase Induction Machine Core Loss Model in the Arbitrary Reference Frame,” in IEEE Transactions on Industry Applications, vol. 53, pp. 4210 – 4220, 2017. S.M. Park, W. Chen, A.M. Bazzi, and S.Y. Park, “A Time-Efficient Approach for Modelling and Simulation of Aggregated Multiple Photovoltaic Microinverters” in Energies, pp. 1-19, Apr. 2017. A.M. Bazzi, M. Stettenbenz, and Y. Liu, “Switched Control Systems Applied to Safety-Critical Motor Drives” in IEEE Transportation Electrification Community eNewsletter, pp. 1-3, Sep. 2016. W. Chen and A.M. Bazzi, “Logic-Based Methods for Intelligent Fault Diagnosis and Recovery in Power Electronics” in IEEE Transactions on Power Electronics, pp. 5573 – 5589, Sep. 2016. A. Kulkarni, W. Chen, and A.M. Bazzi, “Implementation of Rapid Prototyping Tools for Power Loss and Cost minimization of DC-DC Converters,” in Energies, vol. 9, pp. 1-35, June 2016. J. Hare, X. Shi, S. Gupta and A.M. Bazzi, “Faults and Diagnostics in Smart Micro-Grid Electrical Energy Infrastructure: A Review,” in Renewable & Sustainable Energy Reviews, vol. 60, pp. 1114-1124, 2015. A. Ulatowski and A.M. Bazzi, “A Combinational-Logic Method for Electric Vehicle Drivetrain Fault Diagnosis,” in IEEE Transactions on Industry Applications, vol. 52, pp. 1796 – 1807. S.M. Park, S.Y. Park, and A.M. Bazzi, “Input Impedance and Current Feedforward Control of Single-Phase Boost PFC Converters,”, in Journal of Power Electronics, vol. 15, no. 3, pp.577-586, 2015. V.T. Buyukdegirmenci, A.M. Bazzi and P.T. Krein, “Evaluation of Induction and Permanent-Magnet Synchronous Machines Using Drive-Cycle Energy and Loss Minimization in Traction Applications,” in IEEE Transactions on Industry Applications, vol. 50, no. 1, pp. 395-403, Jan.-Feb. 2014. A.M. Bazzi and P.T. Krein “Ripple Correlation Control in Power Electronic Applications from an Extremum-Seeking Perspective,” in IEEE Transactions on Power Electronics, vol.29, no.2, pp.988-995, Feb. 2014. A.M. Bazzi, V.T. Buyukdegirmenci, and P.T. Krein, “System-Level Power Loss Sensitivity to Various Control Variables in Vector-Controlled Induction Motor Drives,” in IEEE Transactions on Industry Applications, vol.49, no.3, pp.1367-1373, May-June 2013. A.M. Bazzi, Zach Klein, Micah Sweeney, Kevin Kroeger, Pradeep Shenoy, and Philip T. Krein, “Solid-State Light Simulator with Current-Mode Control,” in IEEE Transactions on Industry Applications, vol/ 48, no. 4, pp. 1195-1202, Jul.-Aug. 2012. A.M. Bazzi, P.T. Krein, J.W. Kimball, and K. Kepley, “IGBT and Diode Loss Estimation under Hysteresis Switching”,”in IEEE Transactions on Power Electronics, vol. 27, no. 3, pp. 1044-1048, March 2012. A.M. Bazzi, A.D. Dominguez-Garcia, and P.T. Krein, “Markov Reliability Modeling of Induction Motor Drives under Field-Oriented Control,” in IEEE Transactions on Power Electronics, vol. 27, no. 2, pp. 534-546, Feb. 2012. A.M. Bazzi and P.T. Krein, “Concerning “Maximum Power Point Tracking for Photovoltaic Optimization Using Ripple-Based Extremum Seeking Control”,”in IEEE Transactions on Power Electronics (Correspondence), vol. 26, no. 6, pp. 1611-1612, June 2011. A.M. Bazzi and P.T. Krein, “Review of Methods for Real-Time Loss Minimization in Induction Machines,” IEEE Transactions on Industry Applications, vol. 46, no. 6, pp. 2319-2328, Nov.-Dec. 2010. A.M. Bazzi and P.T. Krein, “Comprehensive Flux Estimator Implementation Procedure for Advanced Control of Inverter-Fed Induction Machines,” How2Power Today Newsletter, June 2010. A.M. Bazzi and Philip T. Krein, “System and Method for Compensating for High Frequency Application of Ripple Correlation to Minimize Power Losses in Induction Machines,” US Patent 9007014 B2. A.M. Bazzi, Y. Liu, and B. Davis, “System and Method for Fault Diagnosis of Three-Phase AC Machines Using Time-Domain Adaptive Modulation,” UCONN Invention Disclosure, 18-003. A.M. Bazzi and M. Stettenbenz, “Smooth Switching Control Method in Electric Motor Drives,” UCONN Invention Disclosure, 15-038. M. Tahhan and A.M. Bazzi, “CMM that uses multiple LVDTs to measure pipes,” UCONN Invention Disclosure, 15-016. M. Tahhan and A.M. Bazzi, “CMM that uses an LVDT to measure pipes,” UCONN Invention Disclosure, 15-015. Weiqiang Chen and A.M. Bazzi, “Fault Prognostics of Multilevel Inverters Using On-State Resistance Evolution,” in IEEE Energy Conversion Congress and Exposition, Accepted. A. Mirza, W. Chen, H. Nguyen, Y. Cao and A.M. Bazzi, “High-Voltage High-Frequency Testing for Medium-Voltage Motor Insulation Degradation,” in IEEE Energy Conversion Congress and Exposition, Accepted. Z. Zhang and A.M. Bazzi, “A Novel PWM-Control-Based Strategy for Noise Reduction in Switched Reluctance Motor,” in IEEE International Transportation Electrification Conference, Accepted. W. Chen, E. Hotcjkiss, and A.M. Bazzi, “Control-Strategy-Based Reconfiguration for Short Circuit Fault in Neutral Point Clamped Inverter,” in IEEE International Transportation Electrification Conference, Accepted. Z. Zhang, W. Chen, and A.M. Bazzi, “A New Active EMI Filter with Virtual Impedance Transform,” in Proc. IEEE Applied Power Electronics Conference and Exposition, In Press. W. Chen, E. Hotchkiss, and A.M. Bazzi, “Harmonics and Voltage Quality in Post-Fault Reconfigured Multi-Level Inverters”, in Proc. IEEE Applied Power Electronics Conference and Exposition, In Press. A. Mirza, W. Chen, and A.M. Bazzi, “The Impact of Load Sharing on Multi-drive System Efficiency”, in Proc. EEE Transportation Electrification Conference – India, 2017, In Press. W. Chen, E. Hotchkiss, C. Mademlis, and A.M. Bazzi, “Integrated Fault Diagnosis and Recovery in NPC Multi-level Inverters,” in Proc. IEEE International Symposium on Diagnostics, Power Electronics and Drives, 2017, pp. 415 – 421. Y. Liu, H. Nguyen, A.M. Bazzi, and Y. Cao, “Torque Enhancement and Re-Rating of Medium Voltage Induction Machines Using Nano-Structured Stator Winding Insulation,” in Proc. IEEE Electric Ship Technologies Symposium, 2017, pp. 232 – 237. H. Nguyen, Y. Liu, W. Chen, M. Ghassemi, J. Chapman, A.M. Bazzi, and Y. Cao, “Nanostructured Insulation for High Torque Density Electric Propulsion Motors,” in Proc. IEEE Electric Ship Technologies Symposium, 2017, pp. 274 – 279. Y. Liu and A.M. Bazzi, “Improved Maximum Torque-per-Ampere Control of Induction Machines by Considering Iron Loss,” in Proc. IEEE International Electric Machines and Drives Conference, 2017, pp.1-6. Y. Liu and A.M. Bazzi, “Adaptive Modulation Time-Domain Fault Diagnosis of Three-Phase Induction Machines,” in Proc. IEEE International Electric Machines and Drives Conference, 2017, pp.1-7. W. Chen, P. Han, and A.M. Bazzi, “Evaluation of H-Bridge and Half-Bridge Resonant Converters in Capacitive-Coupled Wireless Charging,” in Proc. IEEE Applied Power Electronics Conference, 2017, pp. 2666-2672. Z. Zhang, Y. Liu, and A.M. Bazzi, “An Improved High-Performance Open-Loop V/F Control Method for Induction Machines,” in Proc. IEEE Applied Power Electronics Conference, 2017, pp. 615-19. Z. Zhang, J.D. Monte, A. Robinson, and A.M. Bazzi, “Electrical Parameter Characterization for Switched Reluctance Motor,” in Proc. Electrical Manufacturing and Coil Winding Conference, 2016, pp. 34-39. Y. Liu and A.M. Bazzi, “Impact of Line Frequency Change on Induction Machine Equivalent Circuit Parameters and Power Losses,” in Proc. Electrical Manufacturing and Coil Winding Conference, 2016, pp. 11-15. A. Ulatowski, Y. Liu, and A.M. Bazzi, “Behavioral Model of Induction Motor Drive Efficiency for Maximum Efficiency Operation,” in Proc. IEEE Energy Conversion Congress and Exposition, 2015, pp. 4894-4898. X. Shi and A.M. Bazzi, “Solar Photovoltaic Power Electronic Systems: Design for Reliability Approach,” in Proc. IEEE European Power Electronics Conference (ECCE Europe), 2015, pp. 1-8. Y. Liu, P. Han, and A.M. Bazzi, “A Comparison of Rotor Bar Material for Induction Machine Efficiency Enhancement,” in Proc. IEEE European Power Electronics Conference (ECCE Europe), 2015, pp. 1-8. X. Shi and A.M. Bazzi, “Reliability Modeling and Analysis of a Microgrid with Significant Clean Energy Penetration,” in Proc. IEEE International Conference on Power Electronics (ICPE – ECCE Asia), 2015, pp. 202-207. A. Ulatowski and A.M. Bazzi, “Induction motor emulation for variable frequency drives testing,” in Proc. IEEE International Electric Machines and Drives Conference, 2015, pp. 1-6. Y. Liu and A.M. Bazzi, “A Comprehensive Analytical Power Loss Model of an Induction Motor Drive System with Loss Minimization Control,” in Proc. IEEE International Electric Machines and Drives Conference, 2015, pp. 1-6. M. Stettenbenz, P. Vicente, and A.M. Bazzi, “Embedded System Considerations for Advanced Algorithms in Electric Drives,” in Proc. IEEE International Electric Machines and Drives Conference, 2015, pp. 1-5. W.Chen, A. Ulatowski, and A.M. Bazzi, “Threshold-based Power Grid Fault Diagnosis”, in Proc. IEEE Power & Energy Society General Meeting, 2015, pp. 1-5. Y. Liu and A.M. Bazzi, “A Detailed Induction Machine Core Loss Model in the Arbitrary Reference Frame,” in Proc. IEEE Applied Power Electronics Conference and Exposition, 2015, pp. 2617-2622. A. Ulatowski and A.M. Bazzi, “Combinational-logic-based traction inverter fault diagnosis,” in Proc. IEEE Applied Power Electronics Conference and Exposition, 2015, pp. 2772-2778. M. Stettenbenz, Y. Liu, and A.M. Bazzi, “Smooth Switching Controllers for an Induction Motor Drive for Reliable Operation After Sensor Failures,” in Proc. IEEE Applied Power Electronics Conference and Exposition, 2015, pp. 2407-2411. X. Shi and A.M. Bazzi, “Fault Tree Analysis of a Micro-grid Using Monte Carlo Simulations,” in Proc. IEEE Power and Energy Conference at Illinois, 2015, pp. 1-5. J. Hare, X. Shi, S. Gupta, and A.M. Bazzi, “A Review of Approaches for Fault Diagnosis in Smart Micro-Grid Components,” in Proc. IEEE Energy Conversion Congress and Exposition, 2014, pp. 3325-3332. A. Xenophontos and A.M. Bazzi, “Analytical Modeling of PV Maximum Power Curves under Uniform and Partial Shading Conditions,” in Proc. IEEE Photovoltaics Specialists Conference, 2014, pp.1982-1986. L. Wang and A.M. Bazzi, “A Dual AC and DC Output Flyback Converter for DC and AC Applications,” in Proc. IEEE Workshop on Control and Modeling for Power Electronics, 2014, pp. 1-5. W. Chen and A.M. Bazzi, “A Fuzzy Logic Approach for Fault Diagnosis and Recovery in PHEV and EV Chargers,” in Proc. IEEE Transportation Electrification Conference, 2014, pp. 1-5. A. Xenophontos, J. Rarey, A. Trombetta, and A.M. Bazzi, “A Flexible Low-Cost Photovoltaic Solar Panel Emulation Platform Based on Multiple Analytical Models,” in Proc. IEEE Power and Energy Conference at Illinois, 2014, pp. 1-5. S.M. Park, A.M. Bazzi, S.Y. Park, and W. Chen, “A Time-Efficient Simulation Strategy and Modeling for Aggregated Multiple Microinverters in Large-Scale PV Systems,” in Proc. IEEE Applied Power Electronics Conference and Exposition, 2014, pp. 2754 – 2761. A.V. Kulkarni and A.M. Bazzi, “A Building-Block Approach to Efficiency and Cost Models of Power Electronic Systems,” in Proc. IEEE Applied Power Electronics Conference and Exposition, 2014, pp. 2727 – 2734. W. Chen and A.M. Bazzi, “A Generalized Approach for Intelligent Fault Detection and Recovery in Power Electronic Systems,” in Proc. IEEE Energy Conversion Congress and Exposition, 2013, pp. 4559 – 4564. A.Silva, A.M. Bazzi, and S. Gupta, “Fault diagnosis in electric drives using machine learning approaches,” in Proc. IEEE International Electric Machines and Drives Conference, 2013, pp. 722-726. A.M. Bazzi, “Electric machines and energy storage technologies in EVs and HEVs for over a century,” in Proc. IEEE International Electric Machines and Drives Conference, 2013, pp. 212-219. A.M. Bazzi and Philip T. Krein, “Utilization of Median Filters in Power Electronics: Traction Drive Applications,” IEEE Applied Power Electronics Conference, 2013, pp. 3055-3060. A. Kulkarni and A.M. Bazzi, “Empirical Cost and Analytical Power Loss Models of DC/DC Inductors,” in Proc. Electrical Manufacturing and Coil Winding Conference, 2013, pp.1-5. E. Hofreiter and A.M. Bazzi, “Single-Stage Boost Inverter Reliability in Solar Photovoltaic Applications”, in Proc. IEEE Power and Energy Conference at Illinois, 2012, pp.1-4. A.M. Bazzi, V.T. Buyukdegirmenci, and P.T. Krein, “System-Level Power Loss Sensitivity to Various Control Variables in Vector-Controlled Induction Motor Drives”, in Proc. IEEE Applied Power Electronics Conference, 2012, pp. 1619-1624. A.M. Bazzi and P.T. Krein, “Constrained Online Efficiency Optimization to Guarantee Load Support in Motor Drives”, inProc.IEEE International Electric Machines and Drives Conference, 2011, pp. 1149-1152. A.M. Bazzi, X. Ding, A. Dominguez-Garcia, and P.T. Krein, “Circuit-Based Reliability Models of an Induction Motor Drive under Different Control Schemes and Safe-Mode Operation,” in Proc. IEEE Applied Power Electronics Conference, 2011, pp. 653-660. A.M. Bazzi, K. Kim, B. Johnson, P.T. Krein, and A. Dominguez-Garcia, “Fault Impacts on Solar Power Unit Reliability,” in Proc. IEEE Applied Power Electronics Conference, 2011, pp. 1223-1231. A.M. Bazzi, Z. Klein, M. Sweeney, K. Kroeger, P.S. Shenoy, and P.T. Krein, “Solid-State Light Source Simulator with Current-Mode Control, in Proc. IEEE Applied Power Electronics Conference, 2011, pp. 2047-2053. P.S. Shenoy, V.T. Buyukdegirmenci,A.M. Bazzi, and P.T. Krein, “System-Level Trade-offs of Microprocessor Supply Voltage Reduction,” in Proc. IEEE International Conference on Energy Aware Computing, 2010, pp.1-4. A.M. Bazzi and P.T. Krein, “An Overview of Loss Minimization in Machines,” Electrical Manufacturing and Coil Winding Conference, 2010. A.M. Bazzi and P.T. Krein, “Comparative Evaluation of Induction Machines for Electric and Hybrid Vehicle Applications Based on Dynamic Loss Minimization and Drive-Cycle Energy,” in Proc. IEEE Energy Conversion Congress and Exposition, 2010, pp. 3345-3351. V.T. Buyukdegirmenci, A.M. Bazzi, and P.T. Krein, “A Comparative Study of an Adaptive Perturb and Observe Algorithm and Ripple Correlation Control for Real-Time Optimization,” in Proc. IEEE Workshop on Control and Modeling of Power Electronics, 2010, pp.1-8. A.M. Bazzi, A. Dominguez-Garcia, and P.T. Krein, “A method for impact assessment of faults on the performance of field-oriented control drives: A first step to reliability modeling”, in Proc. IEEE Applied Power Electronics Conference, 2010, pp. 256-263. K. Kroeger, S. Choi, A.M. Bazzi, B. Johnson, and P.T. Krein, “A digital implementation of continuous-time ripple correlation control for photovoltaic application”,in Proc. Power and Energy Conference at Illinois, 2010, pp. 7-11. S.Choi, A.M. Bazzi, and P.T. Krein, “Ripple Correlation Control Applied to Electric Vehicle Regenerative Braking”, in Proc. Power and Energy Conference at Illinois, 2010, pp. 88-92. A.M. Bazzi and P.T. Krein, “Comprehensive Flux Estimator Implementation Procedures for Advanced Control of Inverter-Fed Induction Machines,” in Proc. Electrical Manufacturing and Coil Winding Conference, 2009, pp. 1-9. A.M. Bazzi, A.P. Friedl, S. Choi, and P.T. Krein, “Comparison of induction motor drives for electric vehicle applications: dynamic performance and parameter sensitivity analyses,” in Proc. IEEE International Electric Machines and Drives Conference, 2009, pp. 639-646. A.M. Bazzi and P.T. Krein, “A survey of real-time power loss minimizers for induction motors,” in Proc. IEEE Electric Ship Technologies Symposium, 2009, pp. 98-106. A.M. Bazzi, J. Kimball, K. Kepley, and P. Krein, “A simple analysis tool for estimating power losses in an IGBT-diode pair under hysteretic control in three-phase inverters,” in Proc. Applied Power Electronics Conference, 2009, pp. 98-106. A. Davoudi, A.M. Bazzi, and P.L. Chapman, “Application of synergetic control theory to nonsinusoidal PMSMs via multiple reference frame theory,” in Proc. Annual Conference of the IEEE Industrial Electronics Society, 2008, pp. 2794-2799. A.M. Bazzi and P.T. Krein, “Input power minimization of an induction motor operating from an electronic drive under ripple correlation control,” in Proc. IEEE Power Electronics Specialists Conference, 2008, pp. 4675-4681. A.M. Bazzi and S. Karaki, “Simulation of a New Maximum Power Point Tracking Technique of Multiple Photovoltaic PV Arrays,” in Proc. IEEE International Conference on Electro Information Technology, 2008, pp.175-178. A.M. Bazzi and D. Fares, “GIS-based wind farm site selection in Lebanon,” in Proc. IEEE International Conference on Electro Information Technology, 2008, pp.201-204. Ray Necci, A.M. Bazzi, S.Y. Park, U. Pasaogullari, P. Singh, N. Butterfield, J. Weiss, and A. Xenophontos, “Energy Efficiency and Reliability Solutions For Rail Operations and Facilities,” Connecticut Academy of Science and Engineering, In Press. Zach Klein, Kevin Kroeger, Micah Sweeney, and A.M. Bazzi, “Solid-State Light Simulator,” Grainger Center for Electric Machinery and Electromechanics, Dec. 2010. A.M. Bazzi and P.T. Krein, “A Complete Procedure for State Estimation in Induction Machines,” Grainger Center for Electric Machinery and Electromechanics, April 2010. S. Karaki and A.M. Bazzi, Power electronics experiments controlled using LabVIEW FPGA, Power Electronics Education Workshop (PEEW07), Orlando, Florida, June 16-20, 2007. A.M. Bazzi, A. Maarouf, M. Tarhini, and S. Karaki, “Control of a flywheel energy storage System,” in Proc. 3rd International Green Energy Conference, 2007, pp. 911-919. ECE 3212: Electric Machines and Drives. ECE 5520: Advanced Power Electronics. ECE 5540: Electrical System Protection and Switchgear. ECE 5530: Modeling and Control of Electric Machines and Drives. ECE 3212: Electric Machines and Drives. In addition to lectures, this course includes two lab sections. ECE 4095/6095: Solar Photovoltaic Energy Conversion. ECE 3211: Power Electronics. In addition to lectures, this course includes three lab sections. ECE 6095: Modeling and Control of Electric Drives. ECE 3212 (previously 4095/6095): Electric Machines and Drives. In addition to lectures, this course includes three lab sections. ECE 3211: Power Electronics. In addition to lectures, this course included four lab sections. ECE 4099: Independent Study (Survey of recent electric and hybrid vehicles). ECE 431: Electric Machinery. In addition to the lectures, this course included four lab sections. ECE 431: Electric Machinery Lab. ECE 469: Power Electronics Lab. EECE 473L: Power Electronics Lab. EECE 310L: Electric Circuits Lab. Editor-in-Chief, IEEE Transportation Electrification eNewsletter. Guest Editor, Energies, Special issue on “Power Electronics Optimal Design and Control”. Guest Associate Editor, IEEE Journal of Emerging and Selected Topics in Power Electronics (JESTPE). Member of the Board of Directors, Electrical Manufacturing and Coil Winding Assosiaction (EMCWA). Track Chair (Induction Machines) for the 2014 IEEE Energy Conversion Congress and Exposition (ECCE ’14). Publications Chair for the 2013 IEEE International Electric Machines and Drives Conference (IEMDC ’13). Conference Director of the 2010 IEEE Power and Energy Conference at Illinois. Chair of the IEEE PELS/PES chapter at the University of Illinois at Urbana-Champaign, ’09-’10. The chapter received the IEEE PELS Best Chapter Award during this term. IEEE Member (’10-present), Student Member (’07- ’10). Member of the IEEE power electronics society (PELS), the IEEE power & energy society (PES), and the IEEE industry applications society (IAS). Judge for the Connecticut Invention Connection (’13, ’14). Peer reviewer for various journals: IEEE Transactions on Power Electronics, IEEE Transactions on Energy Conversion, IEEE Transactions on Sustainable Energy, IEEE Transactions on Power Systems, IEEE Transactions on Industry Applications, and IEEE Transactions on Photovoltaics. Peer reviewer for several IEEE conferences.